I recently found an article I'd saved from last year's EDUCAUSE Magazine, on Setting the Stage for Digital Engagement: A Five-Step Approach. The Fall 2014 article advocates that now is the time for higher ed institutions to "build an institutional structure for digital engagement" and to do so "smartly and creatively." It's an interesting read, moreso because it introduces concepts from Usability testing for higher ed to create more engaging and interactive online systems. It's all about understanding the users. If you have worked in Usability testing, you will recognize the first step as crafting sample Personas for your products. From the article: "Developing personas creates an opportunity to build with the end in mind by creating a shared understanding of who the product or service is for. " And the article includes a sample Persona for "Elena," to demonstrate the method. This step highlights the execution of a digital strategy, from finding "the right people to advance core digital initiatives" to embracing "matrixed reporting and project teams." Digital engagement must become a method, so incorporate it into project planning. From the article: "Product management in higher education has often been associated with stewarding a large vendor's product through the enterprise, perhaps an HR performance management tool or a student information system. Today that product management concept needs to extend to embrace new types of properties, such as high-frequency publishing websites built on open-source software." Organizations must instill a cultural value in favor of digital engagement. I view usability and user experience as related, but different. Usability is about getting something done; user experience is about the user's emotional impression. Lots of things can affect the emotional experience, including colors, fonts, and images or icons. Engagement doesn't stop with the application; in a modern enterprise that must respond to user demand, digital engagement also means user interaction in digital media. The article advises: "Find the local social media leaders and empower them. All colleges and universities today have people who are passionate about their work and who are blogging, tweeting, and/or posting. … Find such people, support them, and connect them to others within the institution." This semester, I have been teaching an online class on the usability of open source software (CSCI 4609 Processes, Programming, and Languages: Usability of Open Source Software). I'll write a reflection on this soon. In our class, I asked students to do their own usability test as a final project, from capturing the Personas, documenting the use Scenarios, defining the Scenario Tasks, and moderating a usability test on their favorite open source software project. To get them ready for the final project, I had students moderate a "mini-project." I selected the topic for the mini-project, based on what open source software everyone claimed some level of familiarity with. 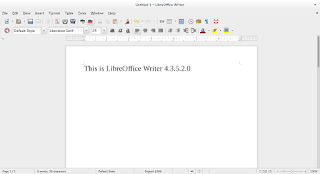 We did our usability test "mini-project" using LibreOffice. 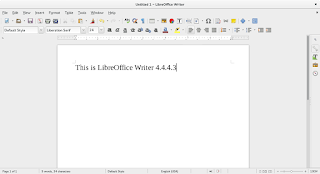 This was interesting for me to observe as the instructor, because I am a user of LibreOffice on Linux, and have followed (somewhat) the user interface changes the project has made to improve usability. 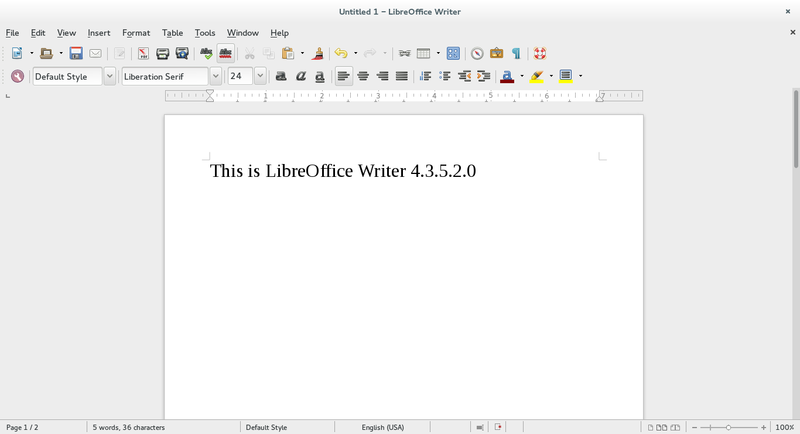 I'd like to take a moment to share these three snapshots in LibreOffice's usability: from 4.3 to 4.4 to 4.0. Please ignore the different user interface font in the 5.0.3.2 screenshot. I have been experimenting with Droid Sans as my GNOME user interface font, in researching another blog post about GNOME. 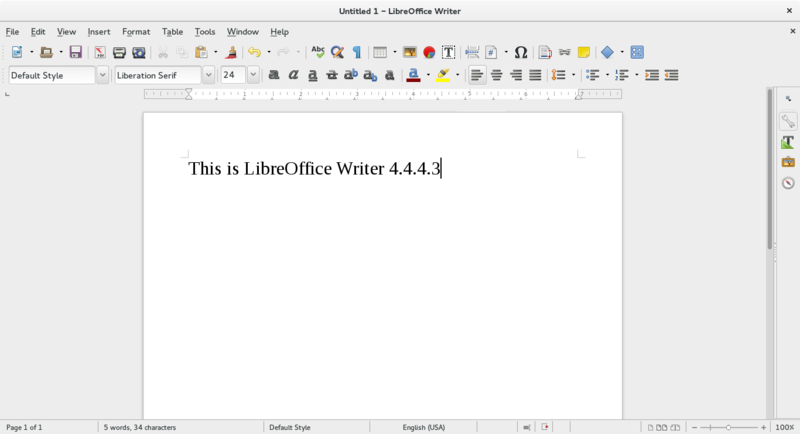 LibreOffice provides more options to save your document in later versions, adding a "Save As" icon (floppy disk with a pencil) but dropping the "Send" option (envelope). Relative position of the "Spell check" icon ("Abc" with a green checkmark) changes from version to version. Character formatting options expand in later versions. From 4.3 to 4.4, you can now add strikeout, superscript, and subscript. from 4.4 to 5.0, you can also do outlining. 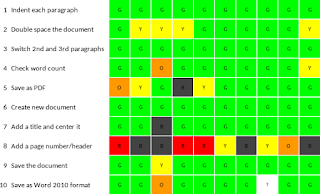 Relative position of text color and highlight changes. Placement of indent (and "out-dent") and bullet/numbered lists icons changes from version to version, including relative position. Overall, the user interface (including Properties menu, icons, etc) seems more complex in later versions than in earlier versions. The usability test mini-project from my class didn't exercise most of these new tools on the toolbar. But ours was a very straightforward test. Our sample Persona was an 18-year-old university student (liberal arts major) using LibreOffice for the first time. Our Scenario Tasks (the tasks that form the usability test) exercised only basic functionality. This was not a "deep dive" into Microsoft Word fidelity or exercising "power user" menus; these tasks were about a college student working on a class paper. Each row in the heat map shows a scenario task, summarized here in a few words. Each column represents a different tester. Comparing these test results to the user interface changes in LibreOffice, most of the toolbar icons aren't used. So these results don't speak to the UI changes there. This usability test mini-project did exercise "Save," "Save As," "Save As PDF," "New Document" and "Center text" functionality. However, we found that most testers skipped the toolbar, and went right to menus. Interesting. These usability test results highlight the difficulty a student has in setting a page number in the header of a document. Note that many testers experienced some frustration in this task, and some were not able to do it at all (black). 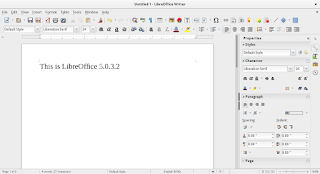 I hope to see more usability testing of LibreOffice in the future. I haven't found a project on usability testing at the LibreOffice website, but LibreOffice doesn't seem to do usability testing anyway. I hope this changes. User interface changes should be driven by users. 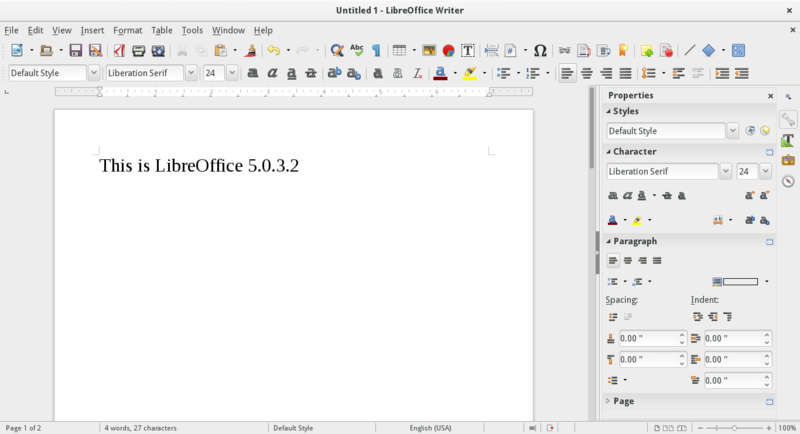 As LibreOffice adds more complexity to the toolbar, I hope they will stop to consider how real people use the software (users are busy people who are trying to accomplish real tasks) and how they access its functionality (usability). Cantarell was full of off-by-ones-or-twos and technical don’t-do-thats, diacritics were inconsistent and Cyrillics still need a look-over. The bold face was in an even poorer state. Back in June 2013 Adobe’s contributed a new high-quality OpenType/Postscript-flavor hinting engine. The problems were only magnified because the new engine actually takes hinting information seriously and will spit out garbage when the font designer isn’t careful. Nikolaus has cleaned up the fonts considerably by fixing the blue zones, outline precision to fall within them and numerous other problems. You might also notice that letters like bdfklh are a bit taller for a more harmonious look. It should display consistently at all sizes now. I am thrilled for this news! For a while now, I have replaced Cantarell as the default font in my GNOME desktop with the Droid Sans font. It just looked better on my display at work. (Oddly, Cantarell still looks great on my laptop at home.) Droid Sans is a nice user interface font, and it has a modern look. With the improvements in Cantarell, I look forward to switching back. This also comes at an interesting time. I have been planning a blog post to discuss the GNOME user interface in terms of branding and wayfinding. In preparing the post, I have been breaking down what I perceive to be the essential branding elements, what are the minimal visual elements that define "GNOME" as a desktop interface. And in doing that exercise, I discovered that it's not really today's "GNOME" without the Cantarell font. Cantarell is part of of the visual branding for GNOME. Look for that update in the next few weeks.